It's time, once again, for the annual houseboat weekend on the ever-shrinking reservoir. Day One, or "Getting there is not half the fun"
"Day One" is actually quite misleading. Weeks of preparation have led to this moment - everything and anything one might imagine that one needs to make and/or acquire to both maintain and entertain oneself on a 50 foot long floating Single-Wide for 5 days has been considered, downloaded, purchased, cooked,bagged, batteried, and packed; charging cords and adapters double-checked, inflators procured, and transportation maintained. Let us not forget the coordination of multiple caregivers and preparations to keep the household running in your absence. Mental checklists overlap and repeated inquiries are made to verify the contents of each container of supplies. 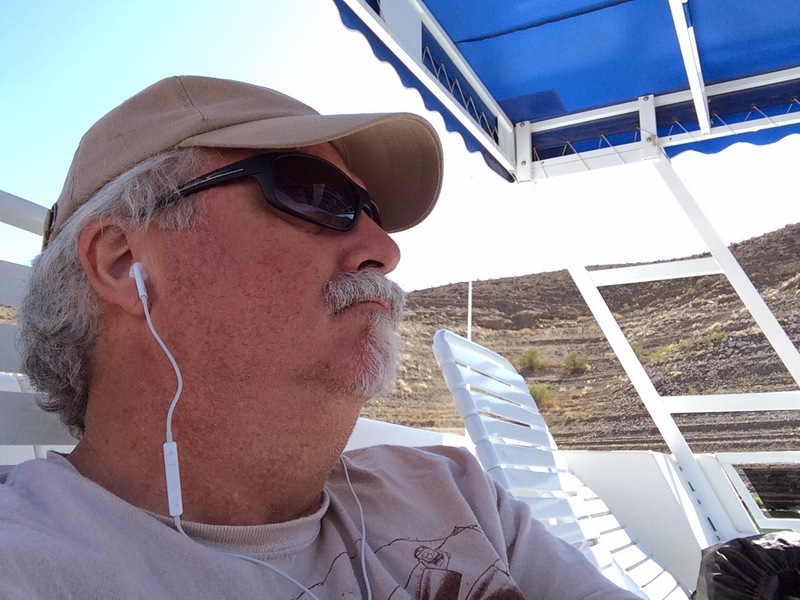 At last, we set out on our 5 hour run across the desert border to Henderson, Nevada, home to the Fiesta Resort and Casino, familiar meeting point for our fellow travelers. Decompression slowly begins as we catch up by the pool to the music of the freeway and railyard, sun setting an orange glow over the smoggy dome that is Las Vegas to the West. Some nachos, then off to bed next to the cycling wall air conditioner that is the hallmark of the under $80/night hotel experience. The alarm chimes much too soon. Day Two, or "Let's move into this apartment with a truckload of stuff in 100° heat!" Shopping and moving - two of my favorite vacation activities. Perishables must be procured, and four of us fan out into the community to acquire them, including 40 bags of ice to be quickly transported the 30 miles or so to the marina. The big Wal-Mart has 9 types of salsa in 4 different locations, which ones shall we buy? I hope we have enough limes. The providence of instant communication ensures that we arrive with 2 packages of E.L.Fudge in a timely and gracious manner. 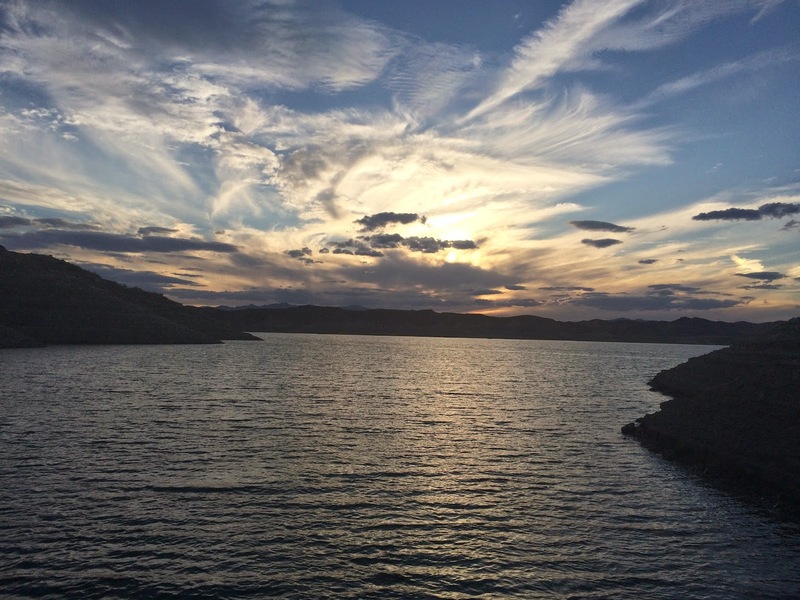 Off to the marina, into the basin that forms Lake Mead. Past the marinas that have closed up altogether, due to the lack of water, to Callville Bay, which is now really Callville Cove. The main launch ramp has been lengthened over the years to the point of abandonment, another one built. New concrete has been poured to the latest water's edge, and we begin the task of loading said supplies onto the houseboat. This is accomplished with the aid of large wheelbarrow-like carts, making it a process of unloading, loading, pulling said carts for a quarter of a mile, and then unloading. In the desert. Supplies and belongings are duly put away in their proper places, and we are piloted out onto the lake and left to our own devices - well, mostly their devices, but you'll see what I mean. Brunch is lovely, and we settle in to traverse The Narrows and the Virgin Basin. Crossing to the other side, we approach a spot to stop and swim. It turns out to be unexpectedly shallow and, one broken prop and a visit from the marina staff, our berth for the night. We swim, lounge, read, and ponder our predicament. Sliders and mac'n'cheese are a hit, and we settle in for our first night under the stars. Day Three, or "Nightmare on Mushroom Cove"
steel stakes and tie the boat securely to the shore against the prevailing wind. 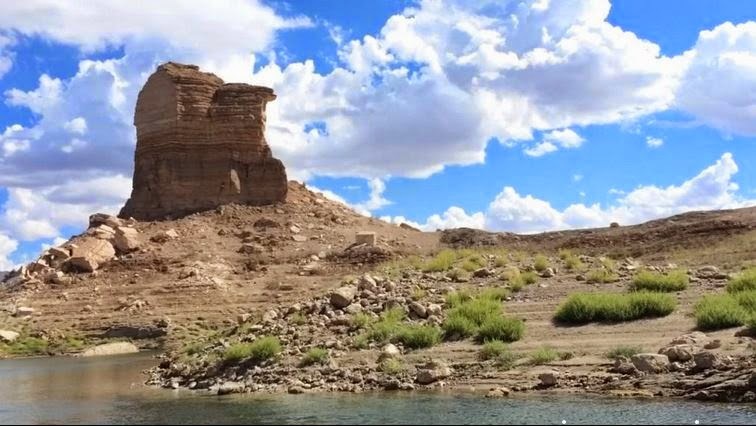 The water temp is wonderful; the gathering thunderheads brilliant white against the pure blue skies and the crumbling Mushroom rock formation to the East. Ribs and Rice in the dining area, A/C cooling as we bob about into the dark. For those who have never been out in the wilderness, the night sky is a major attraction. The Milky Way is spectacular, and one can always see shooting stars to the East, away from the dull glow of the greater Las Vegas valley to the West. On this night, the thunderstorms seem to surround us, and the night was pierced by lightning-light in a spectacularly strobing display. I crawl into bed, as usual, before the others. There is a particular timbre to the sound of steel rebar being struck. We were all instantly brought awake by the tinkling sound of them being dragged down the face of the cove shortly after 1 am. We had just become unmoored. One sprung into action, firing up the outboards to attempt to hold us in place while the other 2 nearly able-bodied of us scrambled to recover and subsequently re-attach said moorings. In the dark. In the sandblasting wind. I did not feel like Thor, holding a 4 foot-long shaft of steel in the middle of a lightning storm. Looking down on the boat from my elevated position on shore, It looked like a Spielberg movie - light spilling from the windows as it pitched and rolled, props churning as the wind shifted and blew the boat promptly into the shore, sideways. Scratch prop #2. We killed that engine and tied the boat to shore that way, settled in uneasily, and all gradually returned to sleep except for me. I listened to a couple of podcasts until I finally dropped off shortly before dawn. Days Four and Five, or "Relaxation under the Helicopter Highway"
We pushed off that morning, prop chewed but still productive, only one of us fell in getting us underway. Off to Temple Bar Marina for gas and ice, then off to another cove for some peace and quiet. Starting at around $200, you can take a helicopter tour from Henderson or Las Vegas to the Grand Canyon and back. 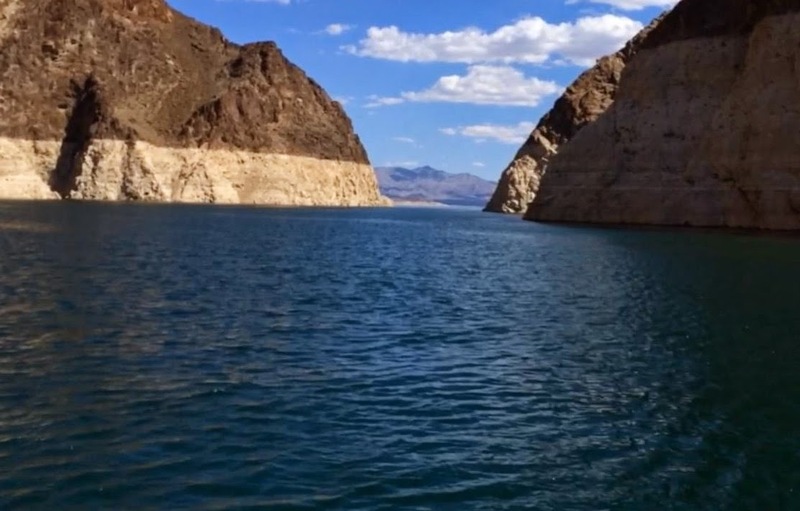 This route will also afford you terrific views of Hoover Dam and Lake Mead. They begin at 7 am and run pretty much every 5 minutes or so until about 4 pm. If you looked straight down from said helicopter while over Lake Mead, this last weekend, you would have seen us looking up at you while we interrupted our conversations to send you a special greeting. It reminded me of the time my family went camping at San Onofre State Beach, where the sound of the freeway is only interrupted by the sound of the trains going by, all night long. We did have beautiful weather, those last two days, and I actually enjoyed a nap befitting one of advanced years such as myself. Good meals and relaxation, brochure-worthy in all respects. Monday afternoon. Let's move again! The great unmingling of provisions back into boxes and then carts and then cars and, after another 5 hour dash home, back into the cupboards and garages to be stored for the next adventure. Four days later, the vertigo has nearly subsided. The insect bites and scrapes have become more evident as the sunburn abates, and I've had two really good nights' sleep in my own bed. I'm looking forward to the weekend.